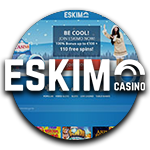 Eskimo Casino is, in their own words, a sweet and cool online casino. This brand new casino is licensed by the MGA and seems to be a promising newcomer. But can they live up to their name? We’ve put them to the test! Visually the casino looks pretty cool indeed. Using primarily frosty blue and white colours, the site looks fresh and clean. We love the little details that go hand in hand with the Eskimo theme, such as the igloo casino. The layout is very straightforward, and is easy to navigate. First time players will have no issues at all using the site, but at the same time it offers enough features to attract experienced gamblers. The site can also be displayed in multiple languages, and players can select their preferred currency during the registration process as well. First things first, to properly investigate this newcomer it’s necessary to create an account. It’s an easy 2-step process, which shouldn’t take you more than a minute or two. In step one you have to fill in your email address, password and choose your currency and country. In step two you’re asked to fill in some personal details. Nothing out of the ordinary is required, it’s pretty standard. When you’ve filled in your details, simply read and accept the terms and conditions and click on the “confirm” button. You will receive an email with a confirmation link to click on, however you will also be logged in automatically after signing up. Eskimo Casino offers a pretty sweet deal to new players. Immediately after registration, players will receive 10 free spins. Although the theme is a snowy and cold winter wonderland, the slot you’ll receive the spins on will surely warm you right up. The free spins are added on a classic looking slot from Amatic: Lightning Hot. This gives players the chance to try out a slot before making a deposit. After the first deposit an impressive bonus and extra spins will be activated. The first deposit will be matched (100% bonus) up to a maximum amount of €100. Furthermore, an additional 100 free spins will be added on Lightning Hot. On the account information page you can find current active bonuses, and previous bonuses. This allows players to easily keep track of all bonuses. Keep in mind that, as with most casinos, bonus money can not be withdrawn as it first has to be wagered. The wagering requirement at Eskimo Casino is 35 times the amount of the received bonus. Like any serious casino, Eskimo offers its players a variety of payment methods. By far still one of the most popular methods is of course paying via your credit card. They accept both Visa and Mastercard. Something noteworthy: they’re verified by Visa and also use MasterCard SecureCode, so you can be worry-free when making a payment. Eskimo Casino also offers the possibility to pay via e-wallets, namely Skrill and Neteller. Keep in mind that you need to have an account with one of these two options beforehand, or simply create one on the spot as it’s really simple. Some players might prefer a more anonymous method. Paysafecard is the perfect option for them, as it’s a prepaid method. They are available in the amounts 10, 25, 50 and 100 euro, and can be bought in local shops. Not sure where to buy them? On the official website of paysafecard you can enter your locality, and easily find out which shops sell them in your area. The prepaid card has a 16 digit pin, which you’ll use to make a deposit to your casino account. Last but not least, it’s also possible to make a deposit via bank transfer. Keep in mind that these transfers are not magical, and it may take a couple of days before the bank and the casino have processed your payment and your player balance is topped up. When entering Eskimo Casino, you’ll immediately notice the five categories at the top of the website. Games are divided in four main categories, and an additional “popular” section only displays the most popular games based on all player activity. The four main categories are Video Slots, Slots, Live Casino and Table Games. In these categories you’ll find games from major slot providers NetEnt and Amatic. Whilst NetEnt is generally known more for modern, feature and action packed video slots, Amatic can be recognized from land-based casinos and offers a wide variety of classic slots. The casino currently (we expect the amount will) grow in the feature) offers more than 150 Video Slots, and 23 classic Slots. Players who prefer to have the “land-based experience” from the comfort of their own house, can find their entertainment in the live casino. Eskimo Casino offers several table games that, via a live video connection, are played with a real croupier. Do you prefer to play table games without a croupier? Then you can choose from 40 games, including blackjack, roulette, baccarat, poker and punto banco. Eskimo Casino believed that their customers are kings and queens, and that they only deserve the best of the best. To make sure you receive the royal treatment you deserve, they’ve employed a skilled and friendly customer support team that is ready to help you out whenever you need. Generally we believe it’s easy to find all information you need on the site, but it might happen that you encounter a small problem or generally just have some questions. 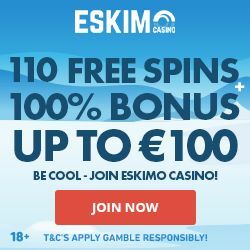 In this case you can contact Eskimo Casino’s support team via email. Prefer a more direct way of contact? You can also reach out via the live chat, or simply give them a phone call for urgent questions. With a variety of more than 200 top-notch games, elaborate bonus and game history pages, and a great welcome bonus, it’s safe to say that this brand new casino is recommendable. Are you looking for a new and cool casino? Then we definitely suggest you give Eskimo Casino a go!